Cyclone Mona, which is travelling through Fiji waters, has become a category two storm. A few hours ago Mona was situated about 300 kilometres northwest of Labasa. The storm is packing winds of up to 130 km/hr as it moves south-southwest. However tonight Mona is expected to turn and move east-southeast towards the Fiji islands of Vanua Levu and Viti Levu. 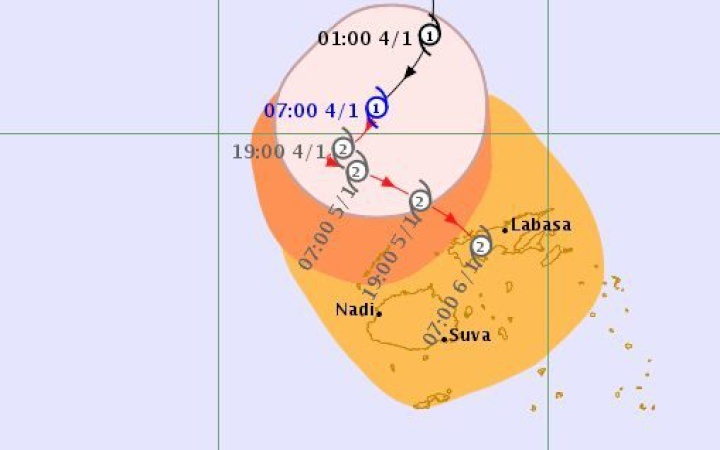 A tropical cyclone alert remains in force for most of Fiji with the far north island of Rotuma already being given the all-clear and the Yasawa and Mamanuca groups maintaining a gale warning. The National Disaster Management Office said flooding may be the biggest threat posed the cyclone as it nears Fiji’s main islands. Mona is projected to come close to the big islands of Vanua Levu and Viti Levu over the weekend. NDMO director Anare Leweniqila said emergency centres had been activated in preparation for the storm. He also said many people had erected temporary structures for holiday celebrations which would need to be pulled down before high winds arrive. “Into the new year there have been a lot of celebrations and communities have put up sheds for celebrations so we have requested all these communities to wind up and prepare to have items taken down and stored up neatly. However Mr Leweniqila said it was flooding from the forecast heavy rains which could cause greater problems. “We have the recent experience last year when we had the tropical depression and cyclone. “For us, not so much the wind last year, but flooding caused havoc in a lot of our towns in the Western Division. So that is the same works and measures that we are undertaking for this particular event,” he said. Mr Leweniqila said local authorities are currently going about unblocking drains.